Russian ice hockey great Alexander Ovechkin has posted a photo, in which he can be seen standing next to Brazilian football icon Neymar, who has been widely criticized for his on-field theatrics. Alexander Ovechkin, a decorated Russian-born winger with the Washington Capitals, has gifted an autographed jersey to Brazilian football ace Neymar. The two athletes met after Brazil's straightforward 5-0 victory over Salvador in a friendly game, in which Neymar scored a goal and assisted another three at the FedEx Field in Maryland. The photo, which Ovechkin posted on Instagram, triggered a barrage of comparisons between the two athletes, many of them criticizing the PSG and Brazil star. "He [Neymar] looks skinny near Ovechkin," one user wrote. Another fan called Neymar "just a baby" in contrast to the Russian strongman. "A great hockey player and a great actor in one photo!" wrote a user going by nickname vip_aka_mad. 8aerospace8 commented, "[This is] a Jersey to grow into." "Careful Ovie, Neymar will fall and roll all over the field with the slightest touch," said eluvsallsports. "Who's the flopping fish in the pic, Ovi?" a user added. A man who identified himself as thomsliney wrote, "Surprised he didn't flop when Ovi put his hand close to him." The jokes apparently referred to Neymar's much-criticized theatrics at the 2018 World Cup Russia. The striker spent almost 14 minutes on the ground during the tournament, according to football statistics, fueling allegations that he was "over-acting." However, Neymar supporters argue that he tends to be a target of rough defenders. In the group stage draw with Switzerland, the 26-year-old Neymar received 10 out of the 19 fouls conceded by his team, more than any other player since the 1998 World Cup. According to ESPN, it was also the most fouls sustained by a Brazilian player in a World Cup match since 1966, when Portugal's rough tactics led to the legendary Pele being kicked out of the tournament. Alexander Ovechkin is a Russian ice hockey winger and captain of the Washington Capitals. 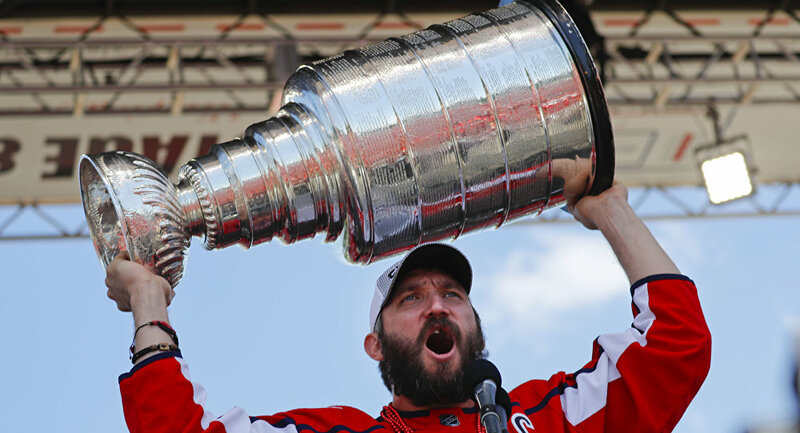 This year, he helped his team win the Stanley Cup, for the first time during his 13-year spell with the NHL club and in the franchise's 44-year history. He also picked up three gold medals at the world championship in 2008, 2012 and 2014.